Guess what it’s like around here this morning? Go ahead! Guess! Need a hint? This also came with a set of cymbals OH YES IT DID! The worst thing of all is that this was not inflicted on us by, say, my rotten little brother their loving uncle or perhaps my revenge-seeking mother their doting grandmother, NO! 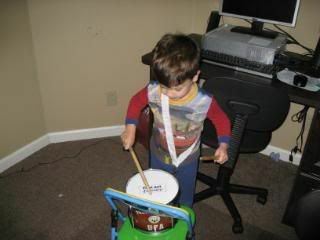 I bought this drum set for my boy. Me! Myself! Bought it, intentionally. I saw it at Toys R Us and I thought, “Oh! Captain Adventure would love this so much!” and then I bought it for him. And I wrapped it. 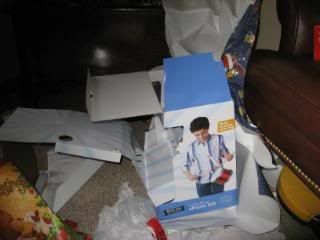 And I put it under the tree. And then actually gave it to him! Right now, the house is full of noise-noise-noise-noise. Boo Bug and Danger Mouse are playing Twister for the very first time in their lives, with their father calling the moves. I’m not sure which is louder, the squeals from the girls or the shouts of laughter from their daddy. There were whistles and plastic harmonicas in the Christmas crackers. The drum and cymbals. The Twister game, the racetrack set. New dresses…and if you think clothing is a quiet kind of present, you have not been around three fashion divas who do not receive many “party dresses” in the average year. The only relatively quiet kid in the house is Eldest. See, she received a new wireless card for her laptop (which is so old I think it is somewhat miraculous that a) any modern wireless card would work with it and b) it can actually, you know, surf the Internet with anything that could be called reasonable speed), and the whole entire world (or at least, that part of it our perhaps overly zealous parental controls will permit) is now at her fingertips. We may not hear from her again for a week. Except when she emerges to yell, “GUYS! Come see the cool game I found! !”, which will be swiftly followed by pounding footsteps up the stairs and a pair of voices shrieking, “COOL!!!! !” from her inner sanctum bedroom. Nossir. The Grinch would not be happy around here this morning. But for us, it’s a glorious tintinnabulation, a raucous celebration of unbridled childhood happiness. The one time of the year when our children are indulged, immersed to their armpits in gifts, doted upon, permitted to eat solid blocks of sugar for breakfast, petted and pampered and spoiled absolutely rotten. It’s a good day to be a kid around here. And a good day to be a parent, too. Hope your holidays are full of the noises you love best, gang. …now. Where did I put the ibuprofen…? FANTASTIC!!! I say the more noise the better!! God bless you one and all. Merry Christmas! My SIL told me she always liked the noisy toys because as long as she could hear them she knew exactly where they were and what they were doing. I've enjoyed your blog immensely ever since I stalked you over here from LBYM. I wish you and yours the merriest of xmas's! To turn the old quote on its head, if you are not good for anything else, at least you are serving as a great example in many ways for the rest of us!